Explanation: One of these two bright sky objects is moving. 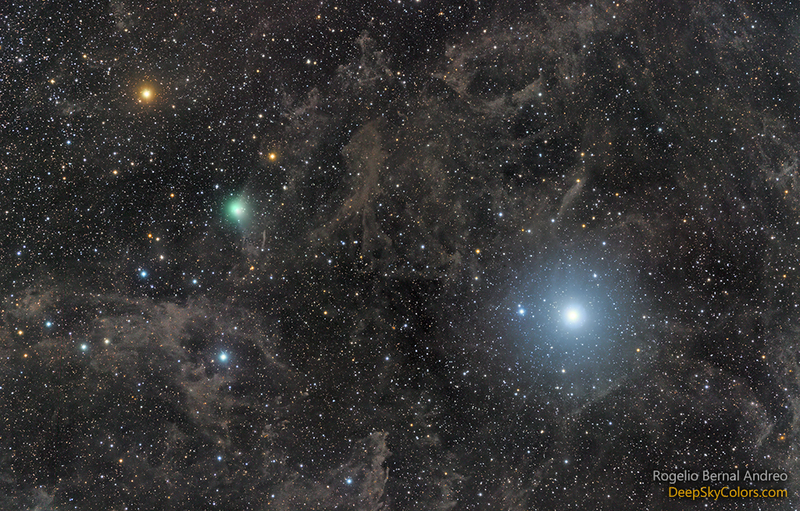 On the right is the famous star Polaris. Although only the 45th brightest star in the sky, Polaris is famous for appearing stationary. Once you find it, it will always appear in the same direction -- all night and all day -- for the rest of your life. This is because the northern spin pole of the Earth -- called the North Celestial Pole -- points near Polaris. On the left, about ten million times closer, is Comet Lovejoy, which noticeably changes its sky position by the hour. The featured image was taken last week. Officially designated C/2014 Q2 (Lovejoy), this disintegrating snowball is on a visit from the outer Solar System and will only appear near the North Star for a few more weeks. That should be long enough, however, for northerners with binoculars or a small telescope to see the greenish coma of this fleeting newcomer, perhaps with the help of a good star map.